Arctic sea ice rapidly melted from 1910 to 1940, and was reduced to two meters thick by 1940. The ice is currently two meters thick, identical to 75 years ago. 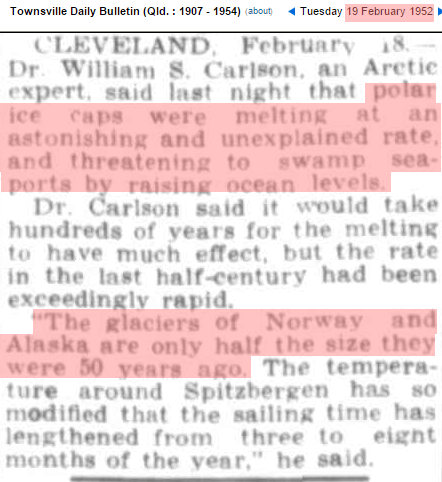 The glaciers of Norway and Alaska lost half their mass by 1950, and experts warned that we are all going to drown. President Obama was in Alaska last week and blamed Americans for melting glaciers, a process which has been going on since before America existed. We have a complete nut job in the White House, who is determined to convince people that he saved the planet. At least 10 Congressional Republicans are supporting his lunacy. Doesn’t get any crazier than that. 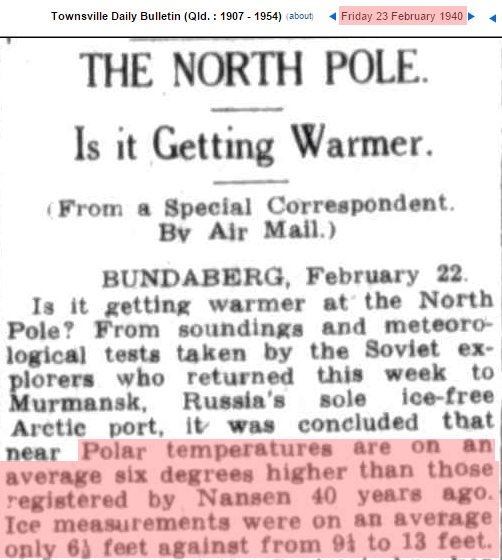 Trouble is AndyG55 ; this is just one of thousands of facts, the Alarmists ignore. Found a link to this on WUWT. A very interesting read. President Obama has saved the US from major hurricanes, as none have hit during either of his terms. Also saved Florida from any hurricanes at all during his two terms! He has stopped the rise of the seas and we’ve had record crops during both his terms as well. Obama even renamed a mountain in Alaska, originally named for an evil dead white male! He single handedly healed the planet. What a great man! What a great President! Obama’s only downside is that he lowered the price of energy when he had promised to drastically raise it. Another great American President, Jimmy Carter did keep that promise, also weakened us abroad and appeased our enemies every bit as much as Obama. So it is a very close call as far as which of the two was our greatest Democrat President. Most all of the old guard RINOs are getting up there now. I would love to see that dinosaur from the Keating Five, McCain beaten severely. Couldn’t believe they re-elected him last time. His buddy Lindsey Graham is no spring chicken either. And then there is that block head leader from Kentucky.